At the last Grambling Presidential Search Committee meeting, search consultants from The Hollins Group recommended we allow for more time to get clarity on higher education’s budget situation before moving forward in our process. Louisiana is facing unprecedented challenges with a $1.6 billion deficit for 2015-16, including a $608 million funding gap for higher education. That equates to an $11 million (83%) loss of state funding for Grambling. The good news is lawmakers are committed to finding resources for higher education. Unfortunately for our search, the legislative session just began this week so we will not know the final budget outcomes until June. Keeping those challenges in mind, plans are underway for the search consultants to release recommended candidate applications on or before May 27th, the search committee to meet in Baton Rouge on May 29th to select semifinalists, and semifinalist interviews to take place on Grambling’s campus the week of June 1st. In response to pleas for us to expedite the search, we are also entertaining the possibility of a special board meeting on Grambling’s campus to make the final decision at the end of the interview week. We believe this gives Grambling the best opportunity to compete for top candidates during this unusual circumstance while maintaining our goal to appoint a president prior to the fall semester. In addition to visiting the search website and providing input to the committee, I encourage you to stay informed about the budget. We launched a special budget section of our website, www.ulsystem.edu/budget and hold weekly budget briefing webinars, www.ulsystem.edu/webinar, every Friday at 11:30 a.m. In order to secure stable leadership for Grambling, we must first ensure stable financing for higher education. 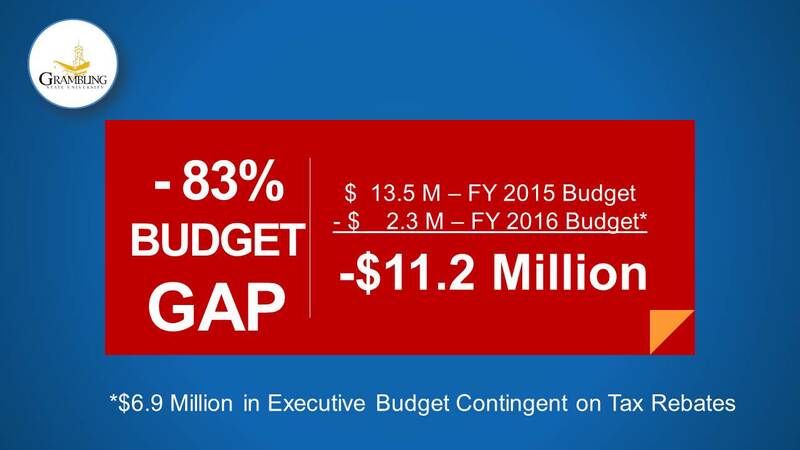 Grambling’s proposed state funding gap in the Executive Budget for 2015-16 is $11 million (83%). This is in addition to the $17 million (56%) of state funding Grambling has lost since 2008-09. 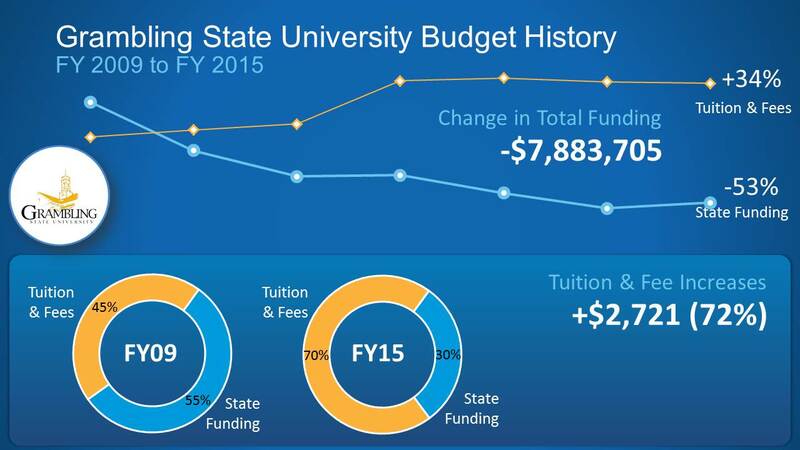 Past increases in tuition and fees offset those losses for a change in total funding of $7.9 million. 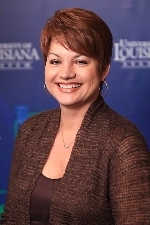 For more information about the budget, visit www.ulsystem.edu/budget. Copyright 2014 University of Louisiana System, All rights reserved.